This Fourth Sunday of Lent, we continue our journey on the road toward the Resurrection. We reflect on the Gospel of John where Jesus heals the blind man, and let us look at three themes of the Christian journey: faith, light and sight. The man blind from birth heard Jesus say, “Go wash,” and so he did. But why did he do as Jesus said? Because of his faith he trusted Jesus. Faith is the trust we have when we hear the voice of Jesus calling us to do what seems impossible. Like the blind man, we may feel in doubt, we may ask questions in those times when we are blinded in our daily struggles. But here, Jesus reminds us to listen to his voice and to have faith in him when he calls us. Jesus also says in the Gospel, “While I am in the world, I am the light of the world.” Jesus wants the blind man, as well as each of us, to know that he is the light of the world. Because Jesus is the light, we can continually gaze upon him as we open up our hearts to Jesus’ presence in our own lives. When we gaze upon Jesus, we realize that Jesus is the source of light and life. The Gospel says that the blind man “came back able to see.” The blind man received his vision, a vision in which we are all called to partake. It is the sight, or vision, of seeing God in others, of seeing God in the world around us, and of having the vision of hope and love. Today, let us remember that when we hear Jesus’ voice, we should answer in faith, trusting his words. The storms of life will come and go, but Jesus will always remain with us, guiding us as the light of the world upon whom we gaze. And when we gaze upon Jesus, our hearts will be opened, and we will begin to see the world as Jesus sees it — we will be his disciples with the vision of hope and love for all. Jacky is a third-year philosophy student at St. John’s University in New York City. 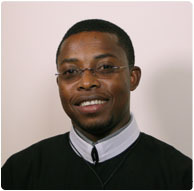 A native of Port-au-Prince, Haiti, he professed vows as a Redemptorist in 2010.